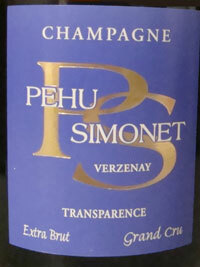 The Pehu-Simonet label was started in the 1970s although the Pehu family has been making estate bottled Champagne for a long time, starting with Veuve Pehu in the early 1900s. Today David Pehu is charge and they have 9 hectares and produce 40,000 bottles a year. The story is that David Pehu prevailed in a "war of wills against his father," and is finally able to make the wines he’s dreamed of making. David's grandfather produced wines under the Antonin Pehu label. The Simonet name, and additional vineyards, came from David's mother. 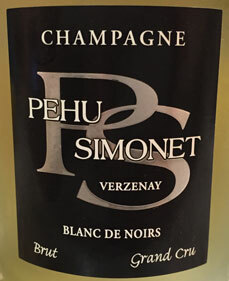 Pehu Simonet Champagne is located in Verzenay in Montagne de Reims, so their emphasis on Pinot Noir, 78%, with only 22 percent Chardonnay, is no surprise. Of their 9 hectares, only 6 are Grand Cru and the rest of his grapes are sold off so they produce only Grand Cru wines. Their Grand Cru vineyards are in Verzy, Verzenay, Mailly, Sillery and Le Mesnil. These are all in Montagne de Reims except for Le Mesnil, more properly called Le Mesnil-sur-Oger, in the Côte de Blancs, famous for Chardonnay including the amazing and famous Krug Clos du Mesnil and Salon. And yes, they make a 100% Le Mesnil Chardonnay. Besides their current wines, described below, they also have a number of interesting experiments planned. These include a Premier Cru still Chardonnay from their three parcels in Villers-Marmery, and 1 hectare parcel in Mailly is being farmed using 100% organic methods that may eventually be used for a single vineyard wine. Pehu says the Chardonnay in Villers-Marmery is clearly Grand Cru quality despite officially being Premier Cru. Depending on the wine, either oak barrels or steel tanks are used. The barrels have traditionally been used barrels from Burgundy, but they are also experimenting with barrels made of local oak from Verzy. Malolactic fermentation is avoided. Pehu believes that avoiding Malolactic fermentation preserves the finesse and expression of the fruit in the long run. 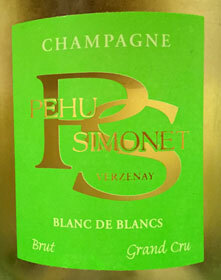 Pehu-Simonet “Transparence” Extra Brut, Non Vintage - 70% Pinot and 30% Chardonnay, vinified in stain steel, and very very dry. Tasting note below. This Rose is 80% Pinot Noir (which includes 10% still Pinot Noir wine for color) and 20% Chardonnay. A big wine. Vinifed in oak barrels. All Verzenay and vinifed in oak barrels. Their 100% Le Mesnil Chardonnay. I look forward to eventually tasting this one. 70% Pinot Noir from Sillery and Verzenay with the rest Chardonnay from Verzenay. Reportedly a kickass non vintage wine! Tasting Note: Pehu-Simonet Blanc de Blancs Brut, N.V. - Nov, 2015, Rated A- and friggin lovely! A very light yellow/straw color with a greenish tinge. The nose is seashells and minerals, Asian pear. Bright and joyful. Delicate yet obvious lime on the palate. Very pure. A little lemon. A wonderful and feminine Le Mesnil yet with plenty of power. Minerals. Finesse. Yummy too. As Zippy The Pinhead would say, "Yow" - I love this. Exquisitely well balanced. Wow, it's been almost 4 years since my last Pehu-Simonet! On the nose, immediate apple, minerals, cherry in the background which became more and more prominent, stone fruits/peach pit, and chalk. The palate is bold, befitting a Blanc de Noirs, with masculine apple. bright red tart fruits, a touch of pineapple, and some creaminess and light raspberry syrup with air. Excellent purity of expression! Lovely! This is a bone dry Champagne, vinified in stainless steel, very low dosage and this year it "accidently" underwent malolactic fermentation. 70% Pinot and 30% Chardonnay. The nose has a little apple juice, small white and yellow flowers, minerals, sandstone, and chalk. On the palate it is light yet long, very dry, with green apples and minerals. This is clearly classy juice, and although I enjoyed it, it did not bowl me over like most critics many of whom rated it outstanding. Perhaps I enjoy a more hedonistic style, and this is not a hedonistic drink, rather an intellectual one. I did however enjoy it very much and must retry it sometime. I do "get it" though. Transparence to the terroir - very low dosage, stainless steel - no wood. Just not my favorite style, although hard to tell from just one bottle. Some descriptions I read sound like they are of different wines.